Händels Messiah performed by four musicians only. Is that possible? Odd Size is four Swedish baroque musicians making their own version of Händels masterpiece. They have created a unique performance of Messiah, with passion, curiosity, beauty, humour and perhaps with a hint of madness too. 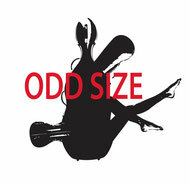 In Odd Size's Messiah, there is no choir, no orchestra and no conductor. The musicians will stretch the limit of what's possible, and the listener will have a chance to come really close to the immortal work of Händel.